Renowned lighting designer, Rob Sinclair and programmer Louisa Smurthwaite used a Jands Vista L5 lighting console to deliver a memorable performance for Florence + The Machine’s triumphant Friday night headlining slot on the Pyramid Stage at Glastonbury Festival. One of the most famous and celebrated music festivals in the world, Glastonbury has provided a global stage for some of the world’s leading rock and popular music artists – with many giving career-defining performances on the iconic Pyramid Stage. 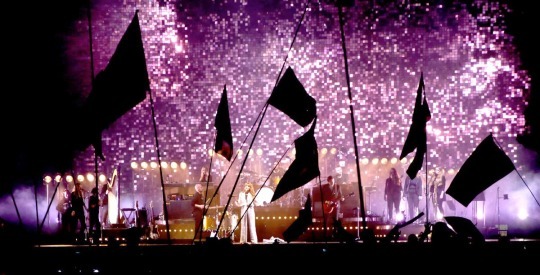 When Florence + The Machine were promoted to top of the bill just one week before the show, after an injury to Dave Grohl forced the Foo Fighters to pull out, Rob and Louisa were faced with the challenge of completely re-designing the show to incorporate the production values of a headliner slot – with only two extra days of production rehearsals available. Willo Perron’s innovative overall show concept and set design for the band’s current How Big 2015 international tour, along with Rob’s elegant lighting design, formed the basis for the Glastonbury performance’s production values. The band’s brief was to come up with a timelessly classic look which wasn’t era-specific. Set pieces included rows of Par Cans custom painted in a metallic copper finish, providing side and back lighting for the band – as well as creating a visually appealing aesthetic look on stage. In addition, the upstage featured a huge 48ft by 28ft ’kinetic wall’ animated by 22 DMX fans, which reflected front light and glistened at various points of the performance – creating amazing reflections. With the band’s tour underway in Europe when the new Glastonbury headline slot was confirmed, Rob had to make the tour’s rig design, which consisted of 5 angled trusses to light the back wall, work for the Pyramid Stage’s rig of three straight trusses, which had already been specified for the Foo Fighters’ performance. The process began with Rob and Louisa sitting down together and reviewing every technical aspect of the show, and how they could change it to make the very best of the rig that they had at their disposal. With the help of Neg Earth Lights, the lighting rig supplier for the Pyramid Stage, Rob was able to add an additional two front trusses containing 30 Martin Viper Air FXs, to light the back surface. Although a considerable amount of work to reprogram the show, Louisa knew that Vista’s Generic Fixture Model and FX Engine would make light work of this task. She commented: “There was plenty of fixture swapping required to reprogram the touring show for the Pyramid Stage. The thing that I love about Vista is that once you ask it to swap one fixture to become another, it simply works. I don’t have to go in and update additional elements or manually link features from one fixture to the next – I am instantly ready to continue my work. In addition, I was really impressed with the FX Engine’s Matrix feature. During the main tour pre-production, we had spent a lot of time making sure that all of the lighting effects that reflected off the backdrop moved in a linear way, to create this fluid, organic type of movement. We used the Matrix feature to achieve this. As these 5 angled trusses were not in the Pyramid Stage’s design, instead we now had 2 straight, front trusses. All I had to do was visually re-arrange my fixtures in the Matrix, to reflect the new design. After doing this Vista automatically updated all of the pre-recorded cues, to maintain our intended looks. During the performance, Louisa operated the main show lighting from the Vista L5 console, whilst Rob took charge of key lighting for TV via two Vista M1s. Having only used the L5 on one previous tour, for Kylie Minogue, Louisa was further impressed with its overall ease of use and reliability. She commented: “The L5 definitely makes a big difference – just having that wide screen to work on is invaluable, it seems to make your mind that extra bit cleaner. Plus having the extra faders at your disposal is great. Rob and Louisa used their touring control system – a Vista S1 connected to an Apple Macbook running the same Vista v2 software – as the backup for the Glastonbury show. Both Vista operators are used to regularly switching between the various hardware models within the Vista range on a tour, to suit different size venues and scale of shows, whilst maintaining all of Vista’s functionality. The Florence + The Machine international tour resumes at the beginning of July in Europe, and is followed by dates in North America and Australia before a UK tour leg. The full tour lighting rig is supplied by Nashville-based Premier Global Productions.